Olivia features a 2-position mechanism that will move your sewing machine into the flatbed and freearm positions. Pull the quick release lever forward to make your sewing well become flush with the top and use Olivia as a desk or another hobby table. 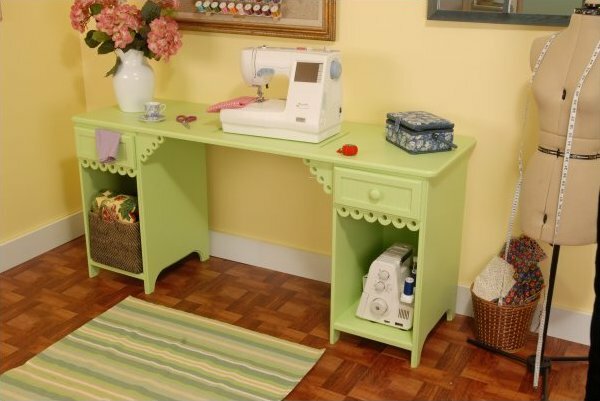 You'll find plenty of storage for your small notions with 2 drawers and 2 deep cubbies for storage of your sewing machine, serger or baskets of fabric. Olivia's wide table top surface allows you to sit center needle comfortably and have plenty of space both on the left and right side of your sewing machine. Olivia has a durable design with composite construction and a vinyl laminate that should last for a lifetime of sewing projects. Olivia comes in a fun vibrant pistachio green or a clean crisp white laminate. She will arrive in 2 separate boxes needing a hammer, a screwdriver and about 1 hours worth of time to assemble.